Little is known about Zenobia, a real historical figure born c. 240 in Palmyra, which is now Syria, though a few attempts have been made to describe her life or her various roles, such as her revolt against Rome and her politics. Libbie Hawker includes author notes at the back about the research she compiled while writing Daughter of Sand and Stone, but she fails to provide citations. Though Hawker writes to engage all five senses, her descriptive powers leave one feeling sick from the excessively poetic and saccharine prose—a little would have gone a long way. There is so much color and scent in this novel it will give the most sensitive a migraine. However, the characters are enjoyable (but not always likeable), and the dialogue is realistic enough, though written in a high fantasy style that can occasionally become tiring. Daughter of Sand and Stone is written in third person present tense for some reason, which makes it difficult initially to get into the narrative flow. Hawker has a solid imagination, filling in the lines for what history fails to unearth about the real life Zenobia, who is arrogant, and at times downright unlikeable as she mocks servants and is ruthless on her way upward, but is nonetheless a strong female character. It is disappointing, however, that Zenobia, doesn’t appear to mature from the beginning chapters, but that’s life sometimes, and power, she continues to be vain—from wanting her face stamped on coins to enjoying people bowing to her. She also insists she is beloved whether or not she has proof of it. Mature readers will quickly become annoyed by this protagonist. The youngest daughter of the Amlaqi chief of Palmyra, Zenobia refuses to be married against her will. When her father dies, she takes charge of her destiny and chooses a man already married, the most influential and wealthy man in Palmyra, the governor. She has a goal: to become Empress of the East. Her path won’t be smoothly paved. She is a second wife, and the first wife won’t let her forget that. She’s in love with her bodyguard Zabdas, who is her friend and protector as well as servant, but they can’t ever be seen alone lest tongues wag and scandal spread. The sections in the book skip over large swaths of time to cover the entire life of Zenobia, leaving the story a bit rickety. It felt at times as if Hawker was growing bored with the history and details and just wanted to wrap up the story as quickly as possible. 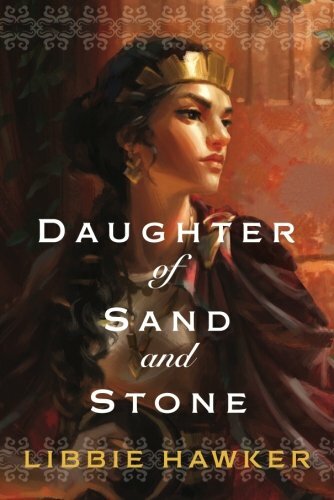 Fans of historical fiction about Cleopatra will want to pick up Daughter of Sand and Stone and read about the headstrong princess who defies family expectations, controls her life, gains the throne, and challenges the Roman Empire.